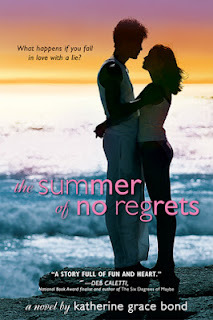 Today Katherine Grace Bond, author of The Summer of No Regrets, is stopping by as part of Sourcebooks' Summer Lovin' Blog Tour to talk about identity, her latest novel, and how she ultimately found herself. Sometimes I feel, as far as social groups are concerned, that I’m sort of a minor hello and goodbye part. As teens read The Summer of No Regrets, I’ve been reading my teenage diary. REALLY embarrassing, but it has to be done. How else will I know whether I’ve actually grown up? I shopped a lot, but thought I looked terrible in the “in” clothes (which included something called “gauchos”.) I went to a folk dance convention, was dumped by my best friend, fought with my mother. My dad yelled a lot. I almost got to be an exchange student in France. I asked a boy named Lyle for his picture every single week. What strikes me, as I read these awkward entries, is that I expected other people to tell me who I was. That was the year I followed puppy-like after friends who treated me shoddily, hoping I’d become worthy. I glowed under the praise of teachers and knew I was smart. I longed to shake off my parents’ overprotectiveness so I’d be mature. I was certain my life would be “so great” if only fill in boy’s name here liked me. Then I’d be pretty. Once, when a brand new song came on the radio, my best friend asked, mid-song, whether I liked it. “I’m not going to tell you,” she replied, and I faced the ultimate dilemma: Should I love it? Should I hate it? I couldn’t know until I got her opinion; I didn’t have one of my own. The still, small voice inside me had gone missing. Though Brigitta in The Summer of No Regrets, hides the “real she,” she’s still more self-possessed than I was. But I did eventually find the “real Katherine,” and I’ve learned a few things about going from fake to real. Create, create, create: write, sing, sculpt, build. What you create is uniquely yours. The more you create, the more comfortable you become in your own skin. Pay attention to your body. That feeling in the pit of your stomach may be telling you to get out of a bad situation. That exhilaration in your lungs may be telling you, “I should come here more often.” Your body knows your likes and dislikes—usually better than your friends do. Love boldly. Notice what you care about and act on it. Homeless kids? Volunteer at the shelter. Poetry slams? Start an open mic. Your grandmother? Pick up the phone. Be an encourager. I’m more myself when I encourage—“calling out” someone’s gift can be life-changing. One of my sweeter diary entries read, “Mary wrote my poem on the front of her notebook. She said, ‘Don’t erase it! 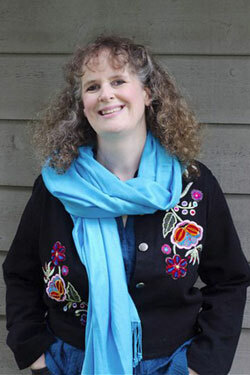 I think it’s so beautiful.’” Mary, now a librarian, always encouraged my writing. Now, through TEENWrite, I get to do the same. And as it turns out, I’m more than a hello and goodbye part. And so are you.